You can export Memory Analysis sessions to XML files if you want to share analysis results. You can also export event data to CSV files if you want to view the data in a spreadsheet application. Although the Memory Analysis tool produces a log (.rmat) file for every session, this file type doesn't have as much information as the XML files generated by the export feature. You can import a log into the IDE, but for the event data to include line numbers (and hence, be readable), your host machine needs to have copies of the application binary and any shared libraries used during the session. Conversely, the XML file format is self-contained and doesn't require any supporting files on the host. Select QNX > Memory Analysis Data, then click Next. The sessions are listed from oldest (at the top) to newest (at the bottom), with checkboxes for selecting individual sessions. There are also Select All and Deselect All buttons. You can enter an absolute host path or click Browse to choose a file from a file selector. You must enter only a file name in the selector—the extension is preset depending on the selection in Options. In the Options panel, select the details for exporting the data. For XML format, click the Export all (xml) radio button. Memory events — Allocation and deallocation of memory. 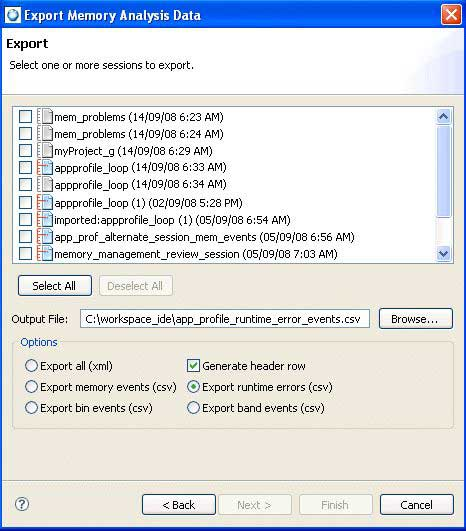 Runtime errors — Memory errors or leaks detected during the session. Band events — Events related to memory bands. QNX Neutrino preallocates small memory buffers (bands) for satisfying requests for small allocations, to improve performance. Band events contain information about how many bands are in use or free at any given time. Bin events — Events related to the user-defined allocation ranges (bins). The allocator gathers statistics about how your application uses these bins. Specifically, bin events report the number of bins of a given size that are in use or free at any given time. To include column headers for the data in the exported file, check the Generate header row box. For more information about the CSV format type, see CSV results file format. Click Finish to perform the export. The resulting output file contains all of the Memory Analysis data for the selected session(s), based on your selected options. Note: When you export session data and then reimport it into a Memory Analysis session view, the session is the same; however, the name, date, and some other properties that are unique to a session will be different.